On Monday, October 29th our school will gather for adoration to our Mother Mary during the Living Rosary. All parents and guardians are welcome to attend. Thanks to our Rosary Club for the wonderful opportunity to come together in prayer during the month of Mary. Our gathering begins at 2:40 p.m. in the school gymnasium. Our school gathered for our Thanksgiving Day Mass with Father Mark on October 5th. We were reminded of the many gifts bestowed upon us and Father Mark reiterated the importance and benefits of prayer and thanking God for our daily blessings. Terry Fox Walk A Huge Success!!!! On Thursday, September 27th the students at St Rene Goupil/St Luke came together to support the Terry Fox Foundation and Cancer Research! They surpassed their fundraising goal of $500 and raised over $800 – A special thanks to Mrs Santarsia & Ms Franzese who organized the successful event! 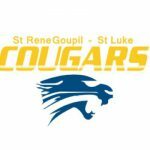 Join St Rene Goupil/St Luke’s twitter account at @srgycdsb and stay tuned to all the exciting events and initiatives that take place every day. It is a great way to be a part of the action and see what is happening at your child’s school! Feel free to visit www.schoolbuscity.com if your child takes the bus to and/or from school commencing this September. You can review your child’s bus stop locations and times. Please allow for some extra time during the first week of school to allow for schedule adaptations when picking up and dropping off your child. Reviewing bus behaviour expectations with your child will ensure that he/she has ... Continue reading "Transportation Information for 2018-2019"